I thought I'd round off my winter sewing fun with a tutorial for the Hoot Hoot Winter PJ's that I mentioned in my last post. The idea for these PJ's was a work in progress in my mind over a few months. 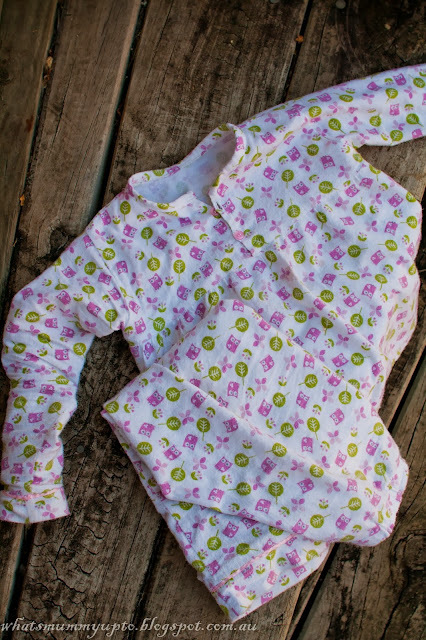 I felt confident with making PJ pants, as I've done them before, but I wanted to have a go at a PJ top (not just an appliquéd store-bought top like my previous PJ's), and I wanted it to be pretty and classic-looking, but different to a full button-down shirt-style top. 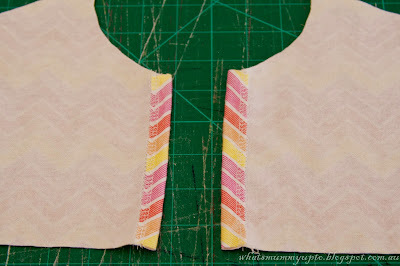 I liked the idea of a fitted bodice, with a loose and super-comfy waist area, and I love the look of those old-style flannelette night gowns ... think the "Raindrops on Roses" scene in Sound of Music .. .anyone know what I mean?!? Anyway, and after a bit of pondering, this is what I decided on. 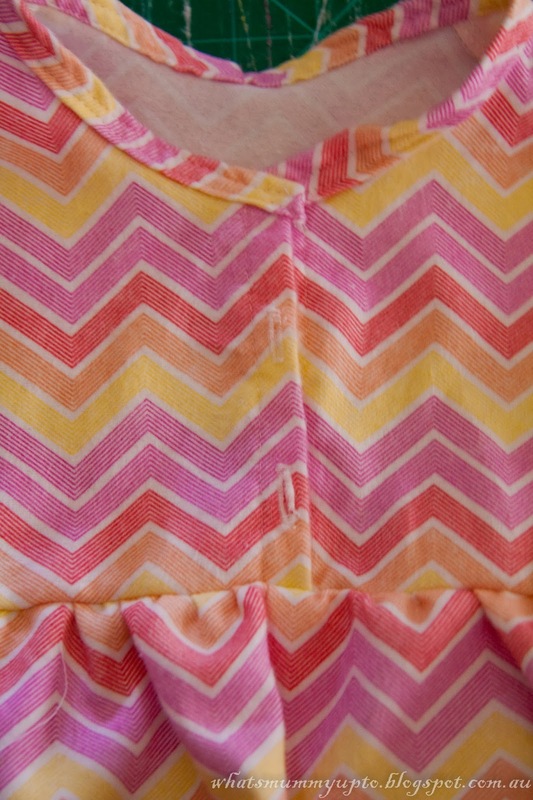 Almost a year ago I made a top with the gathered "skirt" section under a fitted bodice. It was the Olivia Top from CINO that I used as Bethany's Rainbow Top. This time I decided to keep the back as 1 flat piece, and to lengthen the front bodice to come down to just under the armpits. 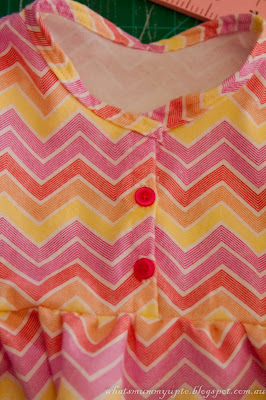 I also avoided a separate button tab by just adding a bit to the width of each front bodice piece. I did however go back and use the awesome tips of CINO for doing the binding around the neckline. 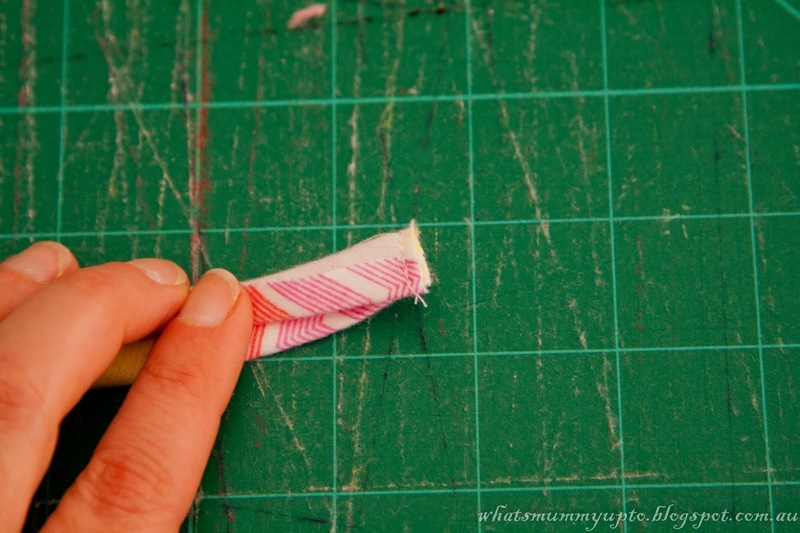 I'm still working at perfecting that skill. Getting that binding flat and sewn straight seems to be something I can just never get right. 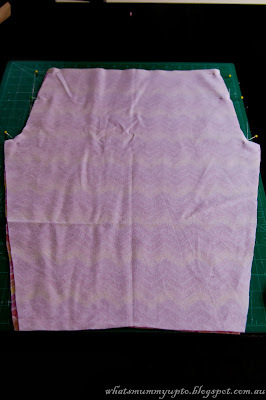 I think it's 'cause I'm impatient when I sew, just itching to get on to the next bit. 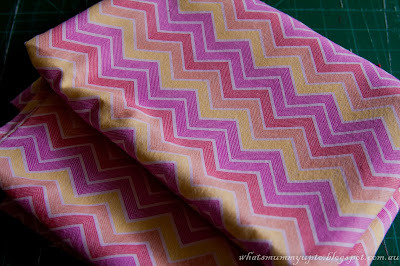 There wasn't enough of my beautiful hoot fabric left for another full pair of PJ's for Hannah, but when I was at my local Spotlight one day I saw this cute chevron flannelette. 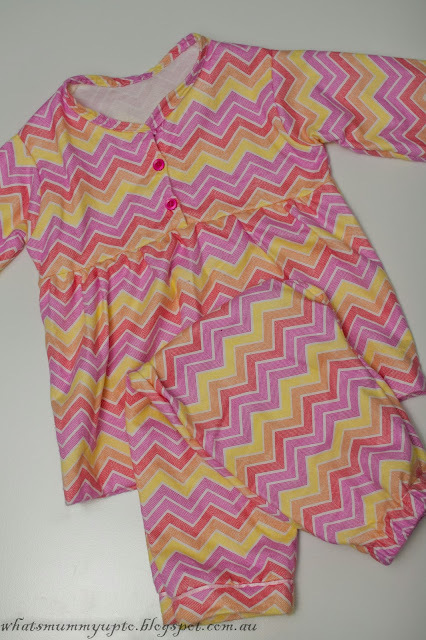 I liked the colour combination, and I'm always a sucker for a chevron, so thought this would be perfect for Hannah's PJ's. As it's heading to summer here now, I made them a little (OK, a lot) on the large side for Hannah, so they were a little big for her to model for a photo-shoot. Hopefully she'll wear them next winter, and maybe even the winter that after as well! 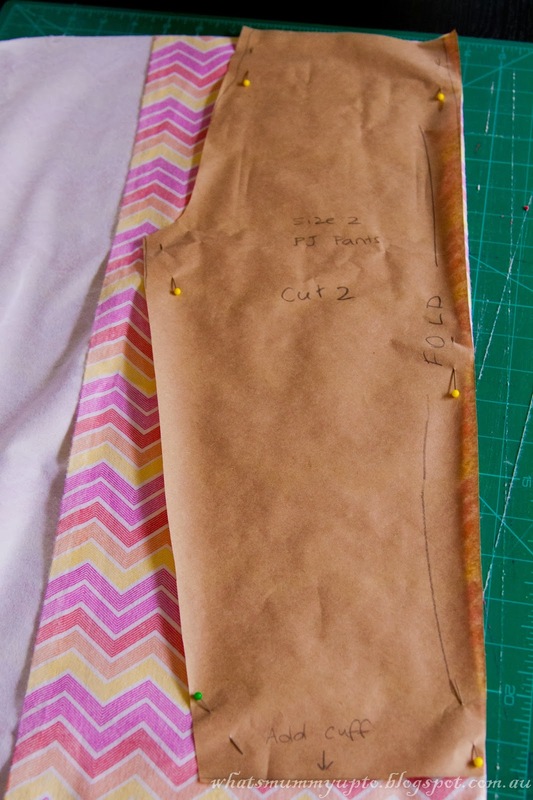 - The usual ... sewing machine, overlocker/serger (if you have one), scissors, tracing paper (I use a roll of brown paper I bought from a $2 shop), pen/pencil, safety pin, pins, ruler/measuring-tape. 1. 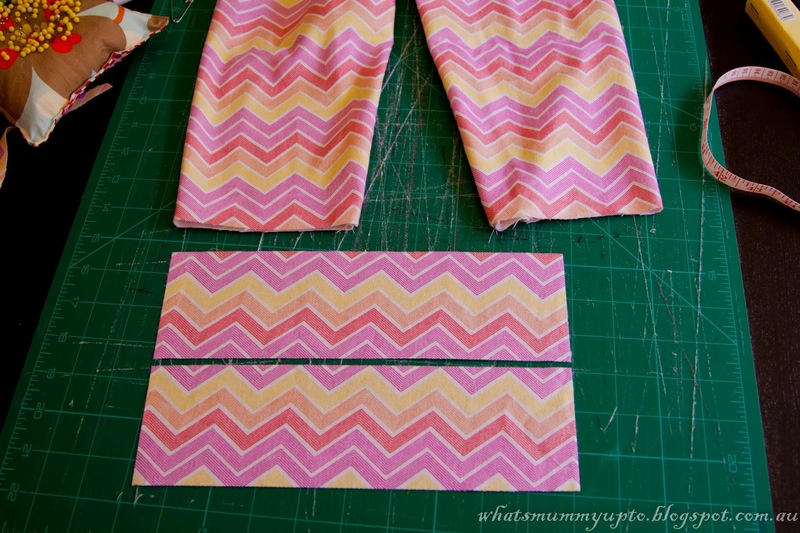 Lay down some paper to trace a pattern onto, and a pair of shorts or pants in the right size. 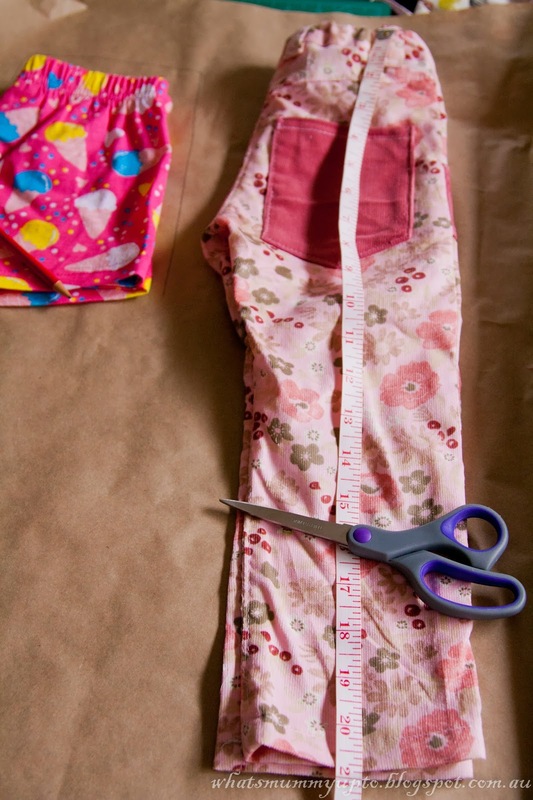 Go for a loose-fitting pair, because PJ's are much more comfortable when they're loose! Trace around the top and sides of the shorts, leaving an extra 1/2" on the sides to allow for a seam allowance. 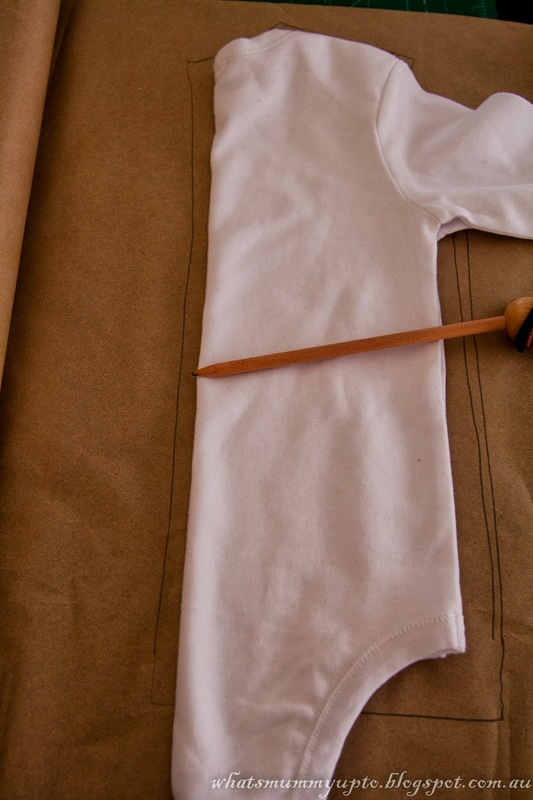 When tracing the waist, go a little wider at the sides to allow for the fact that the elastic is pulling the waist-band in a little. 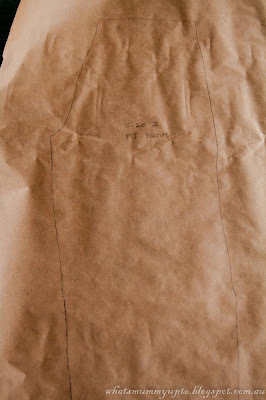 Also add 1 full inch above the pant's you're tracing to allow for a waist-band/casing. 2. 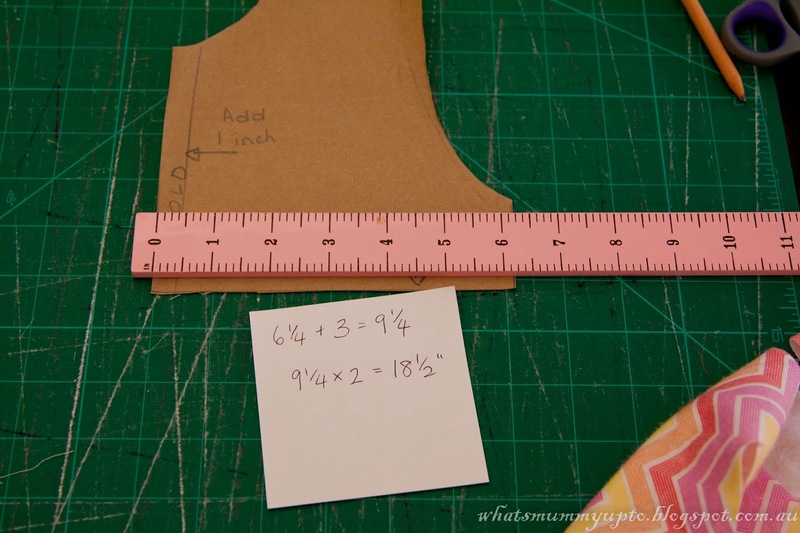 Either measure your munchkin, or measure a pair of pants in the correct size to get your desired length (Don't worry about adding extra at the bottom for the hem, because we will add a cuff later). 3. 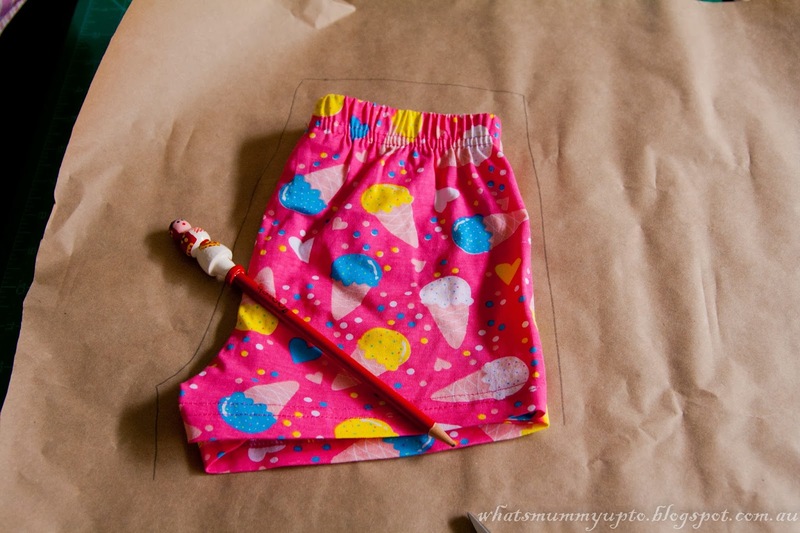 Draw the sides of the pants, remembering that you want PJ pants that are baggy and comfy, so you really don't want to taper them. 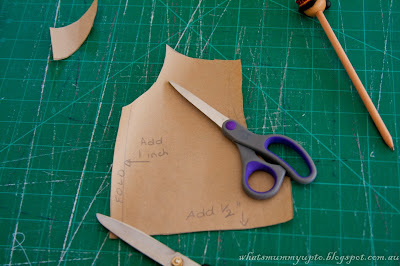 Once you're happy with the shape, cut out your pattern piece. 4. 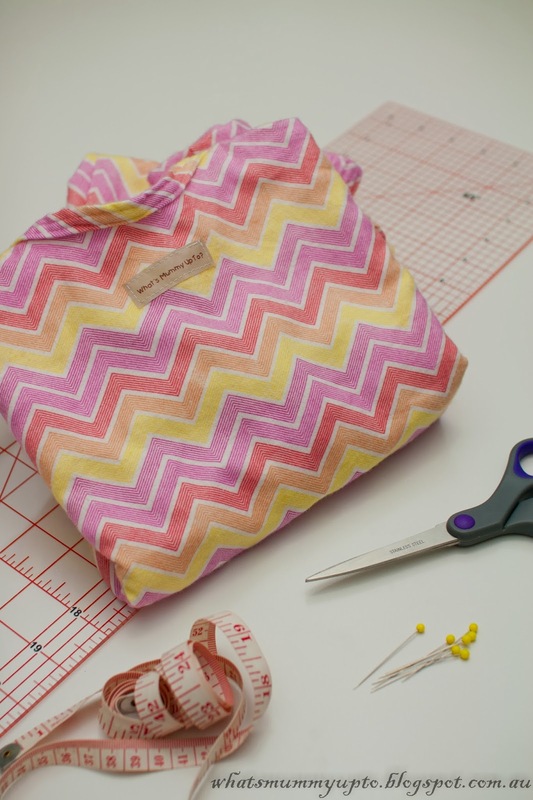 Grab your fabric and fold one side in wide enough to fit your pattern piece. 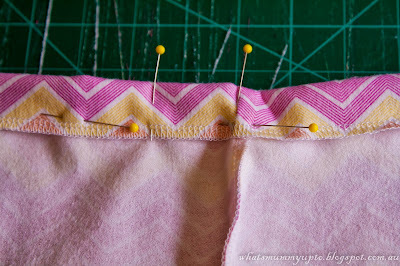 Place the straight side of the pattern along the fold, and pin/weight the pattern down while you cut carefully around the edges. 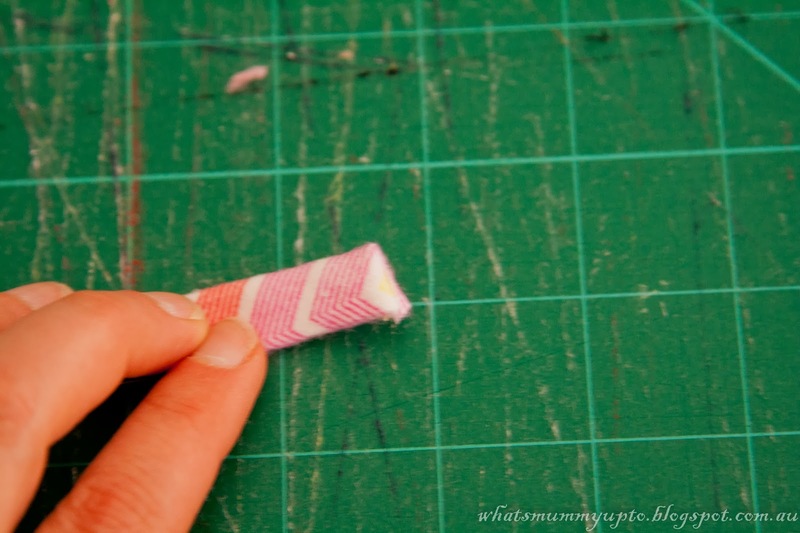 Repeat again to get a second piece the same. 5. 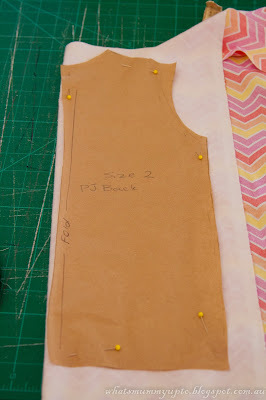 Place your pants pieces right sides together and pin the curved sections. 6. Sew down each curve with a 1/2" seam allowance, then finish the raw edge with an overlocker (serger) or a zig-zag stitch. 7. 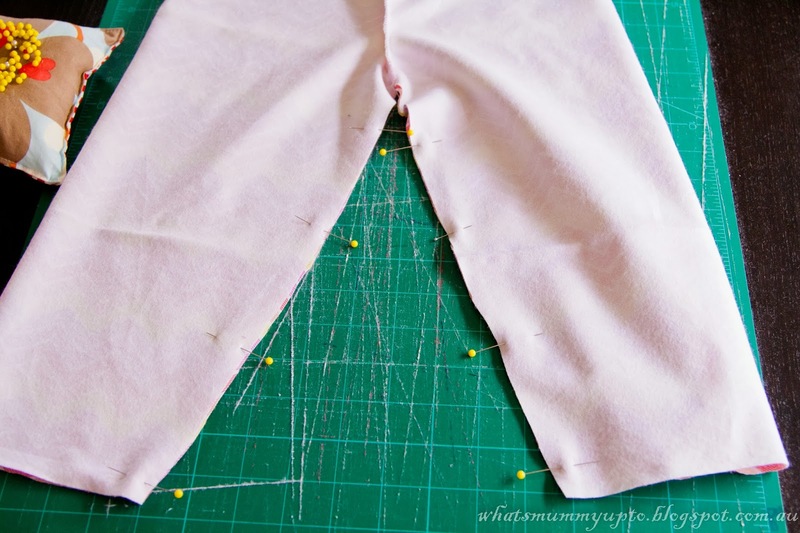 Open up the pants, so that the curves you just sewed are in the centre and you now have something resembling a pants shape. Pin around the inner-leg seam. 8. 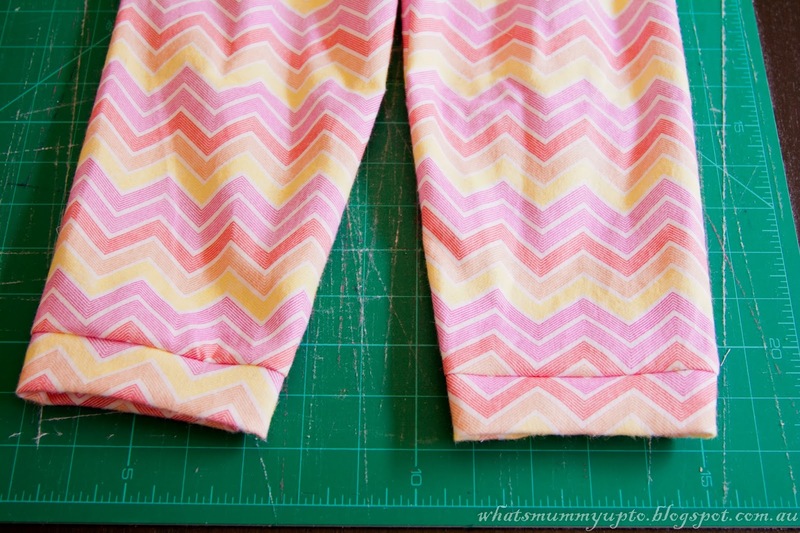 Sew the inner leg, starting at one ankle and sewing up the leg, around the crotch and down the other leg. 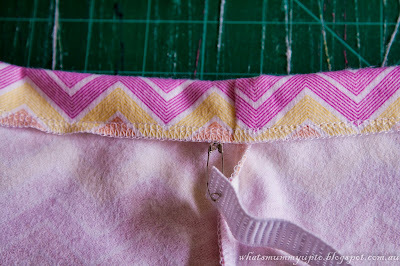 Finish the raw edges with either an overlocker (serger) or with a zig-zag stitch. 9. If you have an overlocker (serger), finish the top raw edge. If you don't have an overlocker, just fold down 1/4 inch and press with an iron. 10. 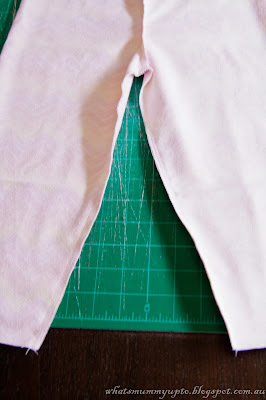 Fold the top edge to the inside of the pants, wide enough to encase your elastic. 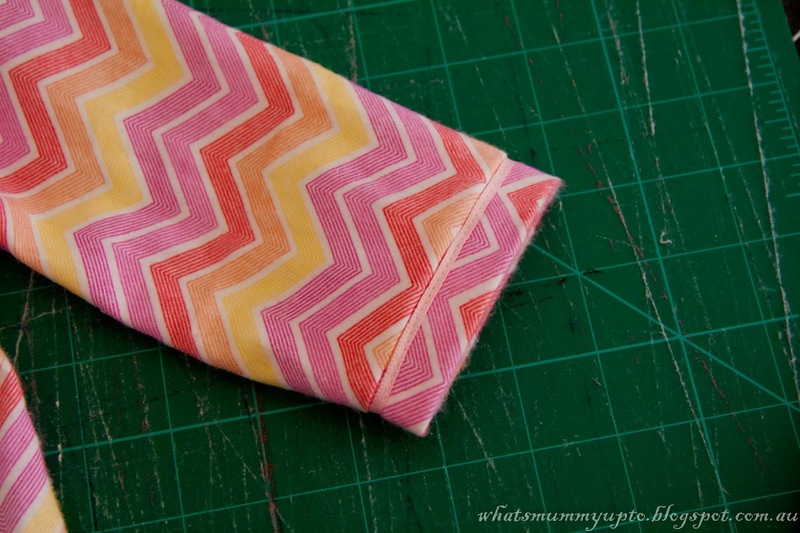 If you have 1/2" elastic, fold down 3/4". It can be helpful just to hold your elastic on top to check you are folding down the correct amount. 11. 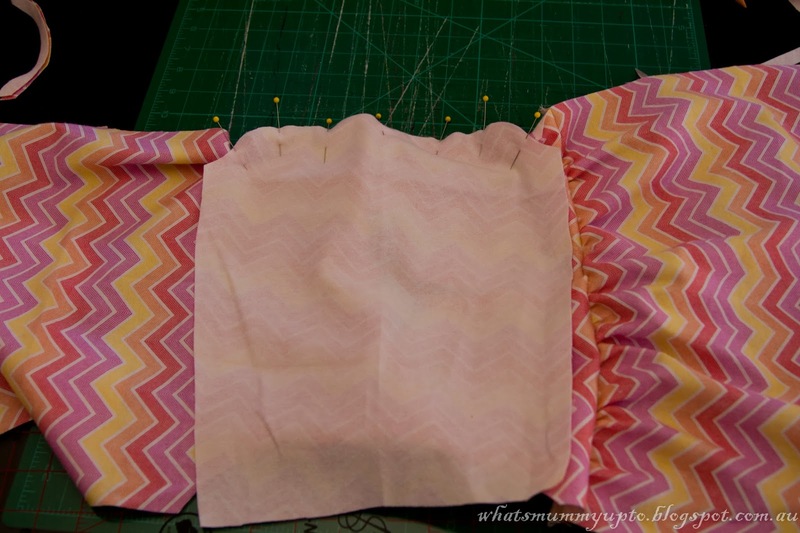 Pin around the waist-band, keeping the width even. 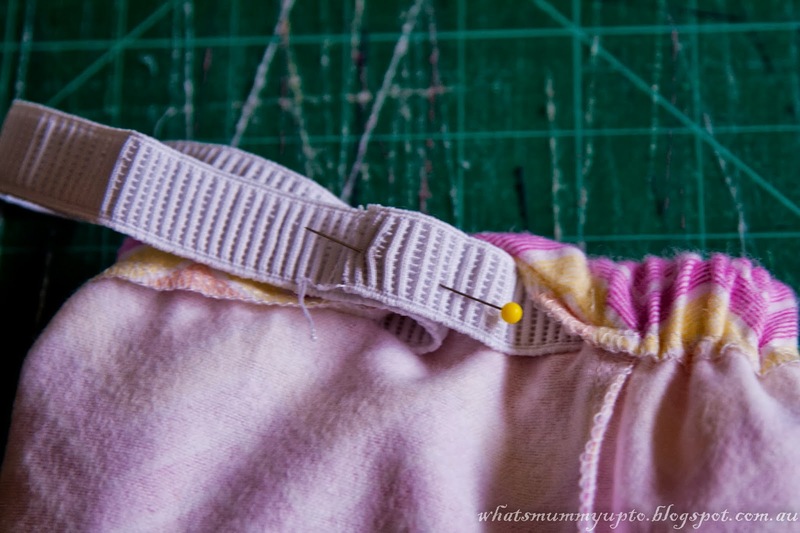 Use pins to mark a 1.5" gap at the back to allow you space to thread your elastic through. 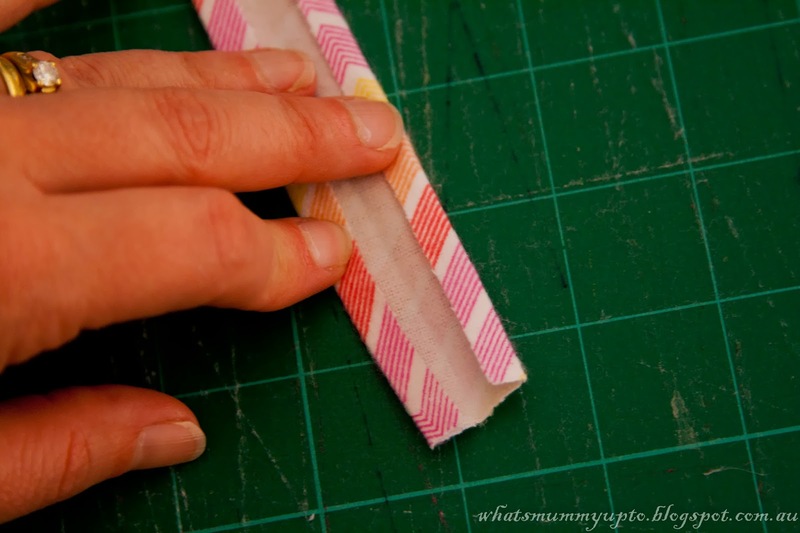 Then start at one end of the 1.5" gap and sew approximately 1/8" from your finished edge all the way around to make your casing. 12. Use a safety pin to thread the elastic through your casing. 13. 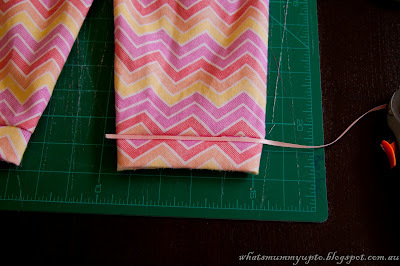 When your elastic is through, overlap the ends by 1/2 inch and sew together using a zig-zag stitch. 14. Sew the gap closed. 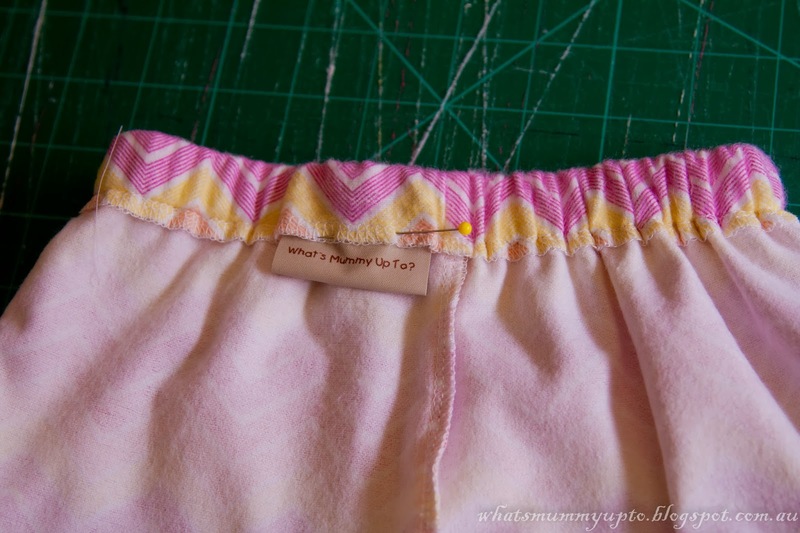 This is a good time to put in a clothing label or a piece of ribbon so that your munchkin knows which is the back of their pants (If they're fussy about that kind of thing like mine are!) 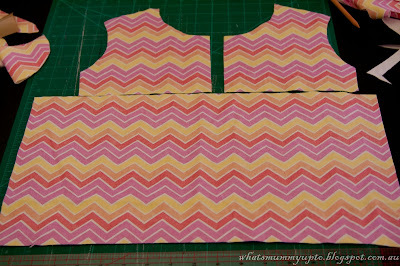 In actual fact, in this design the front and back are identical, which works 'cause they're so baggy, so a label is really not necessary ... but it is fun! 15. Now for the cuffs ... measure the width of the base of the pant legs. 16. 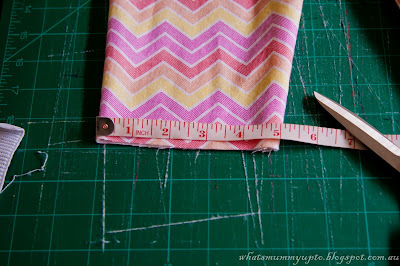 Muliply this measurement by 2, then add 1/2". So, my pant legs were 5" wide, X 2 is 10, + 1/2 is 10 1/2". Cut 2 rectangles that are this measurement (ie 10 1/2" for me) by 3". 17. 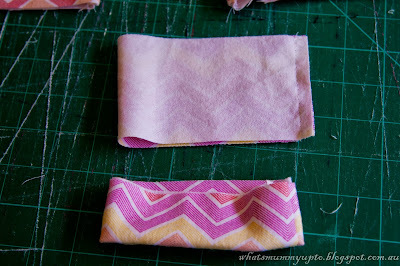 Fold each rectangle in half, right-sides facing, and pin the short edge. 19. 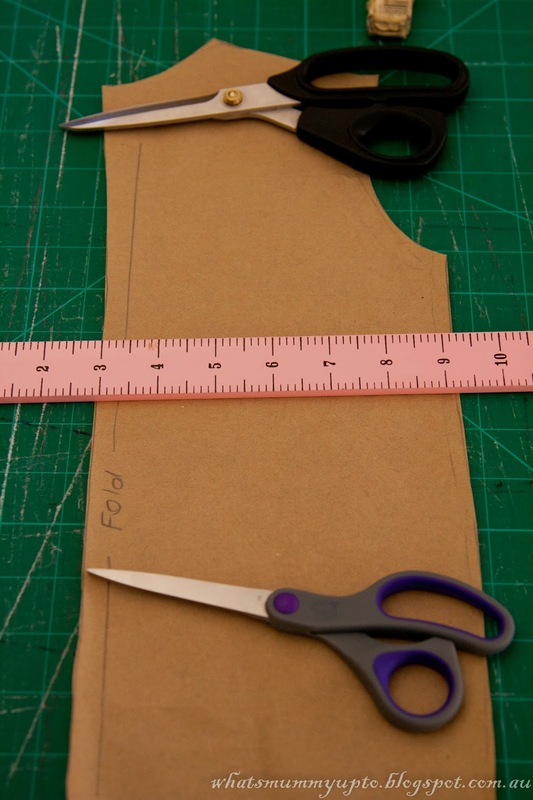 Slide the cuffs over the pant-legs, matching up the raw edges, and lining up the cuff seam with the inner-leg seam of the pants. Pin them all around. 20. Sew around, being careful to catch all the layers (1 layer of pant-leg and 2 layers of cuff). 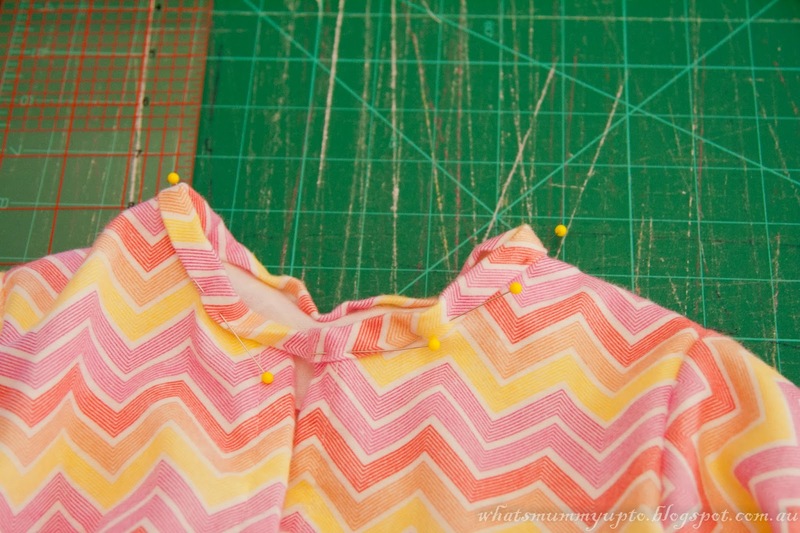 Finish the raw edge with an overlocker (serger) or with a zig-zag stitch. 21. 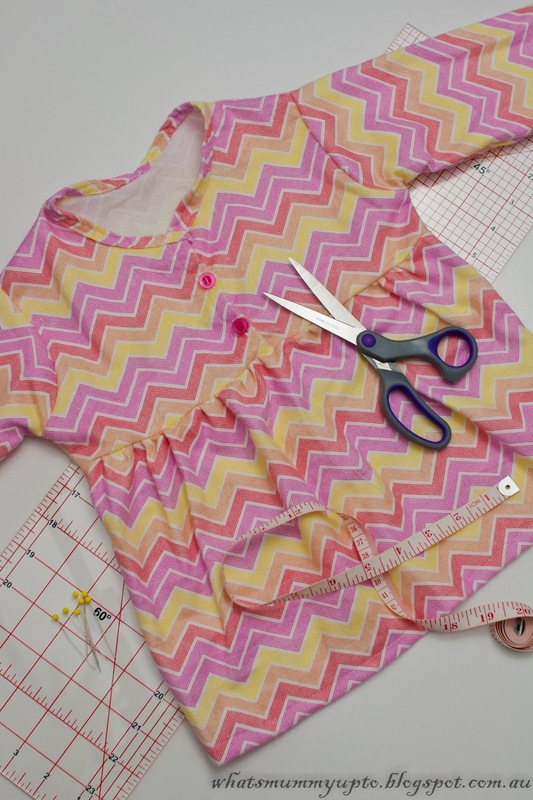 Fold the cuffs down, so you can admire your handiwork. 22. Now, I love the look of the little row of satin piping you see on store-bought PJ's, but I didn't have any piping, or any ribbon wide enough to make my own piping, so I created a cheat with a piece of 1/8" satin ribbon. Place the ribbon on the right-side seam of the cuff, and sew through the middle of the ribbon into the ditch to attach the ribbon. 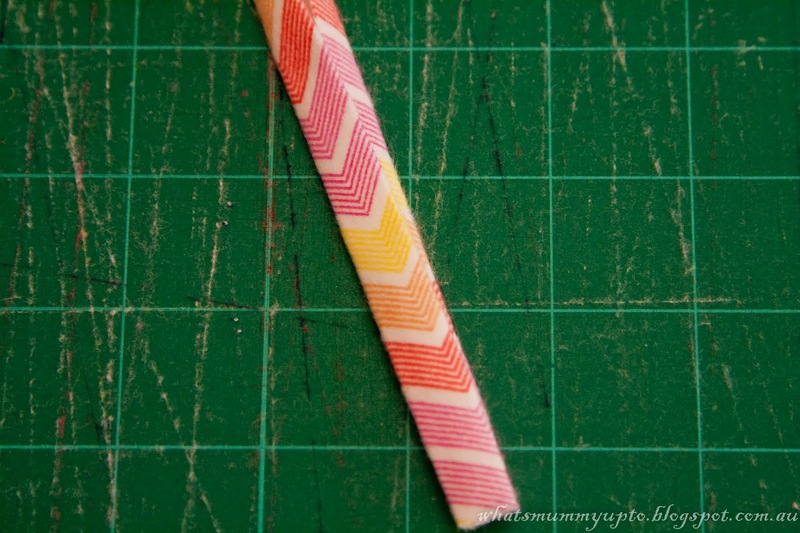 You are the only one who will know that's it's not really piping!! 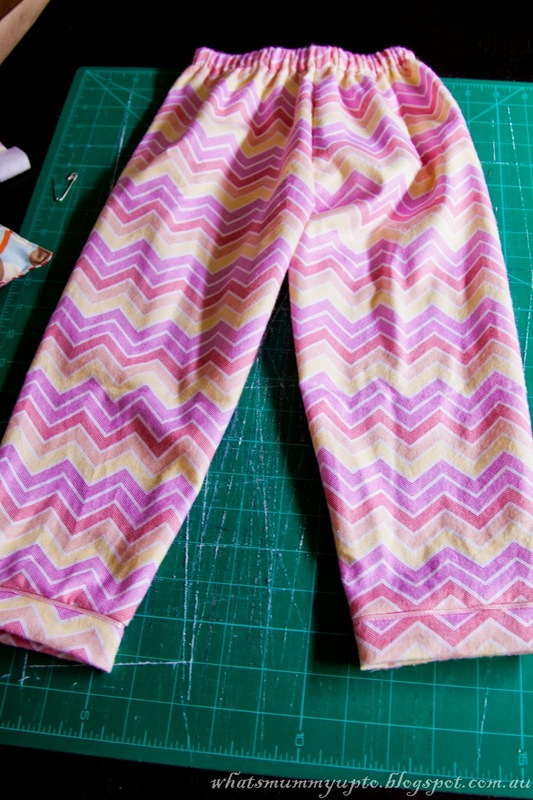 And there you have it ... PJ pants complete! 1. Take out your trusty tracing paper, and a long-sleeve top in the correct size (in this case I used a onsie that is the size I want for Hannah next year). Fold the top in half, with the back of the top facing out. 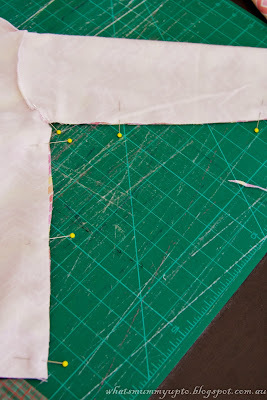 Trace around the edges, leaving an extra 1/2" for seam allowance all the way round. 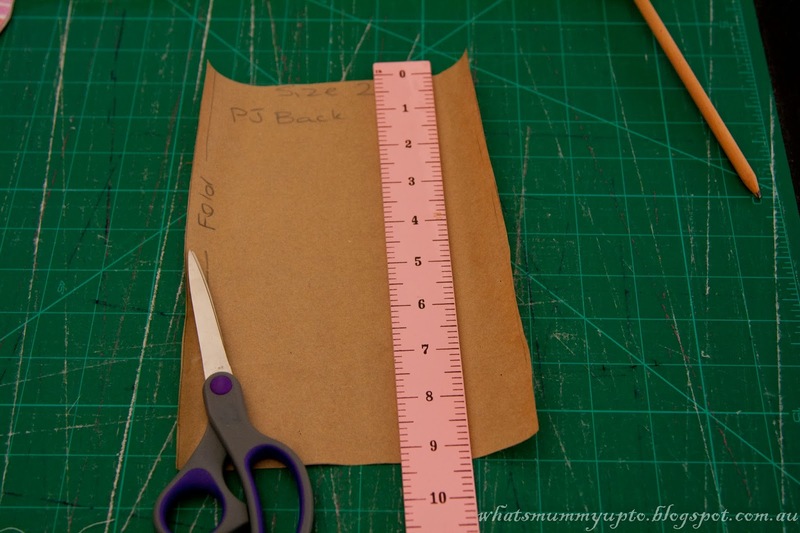 Add an extra 1" at the bottom for seam allowance. 2. To make the sleeve pattern, cut out your bodice pattern, then lay it on some more tracing paper and trace around the arm hole. 3. 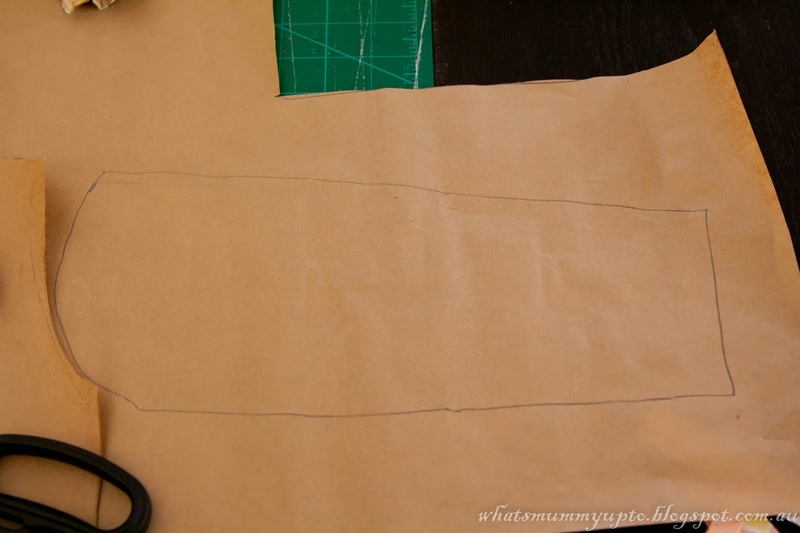 Extend the line of the arm whole a little below (about 1 inch), then use your shirt to trace the length and width of the sleeve, remembering to add 1/2" all round for seam allowance. Again, don't worry about adding extra for a sleeve hem, as we'll add a cuff later. 4. 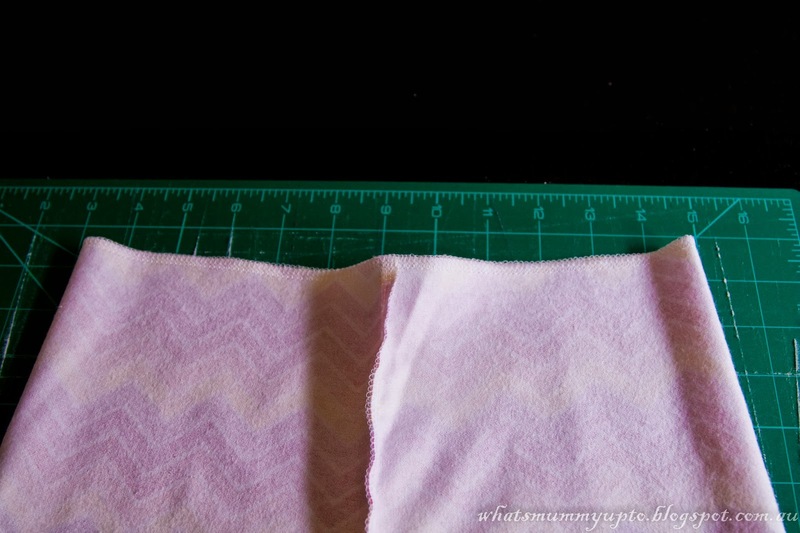 Fold your fabric over with a layer wide enough to fit your "back". 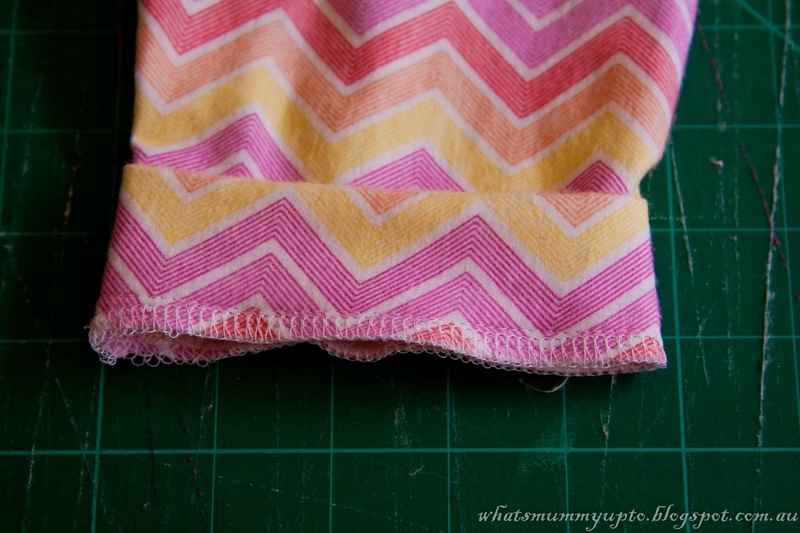 Align the straight edge of your pattern with the fold of the fabric. 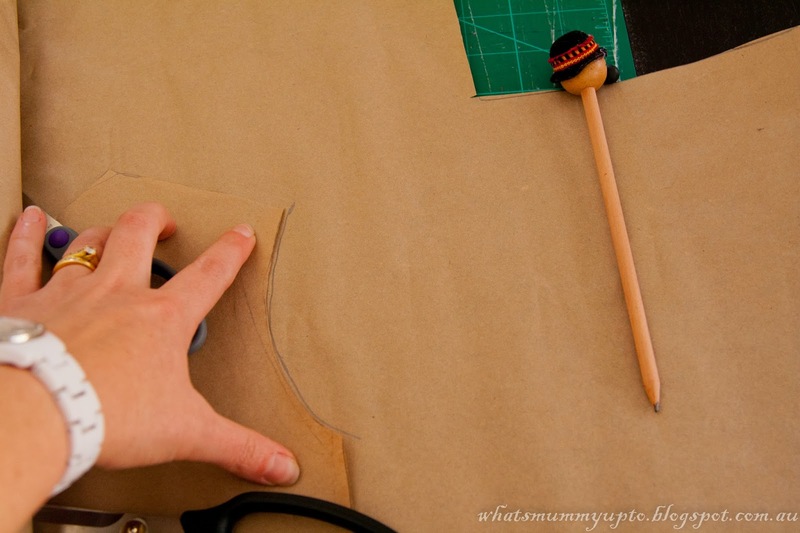 Pin the pattern down and carefully cut around it. 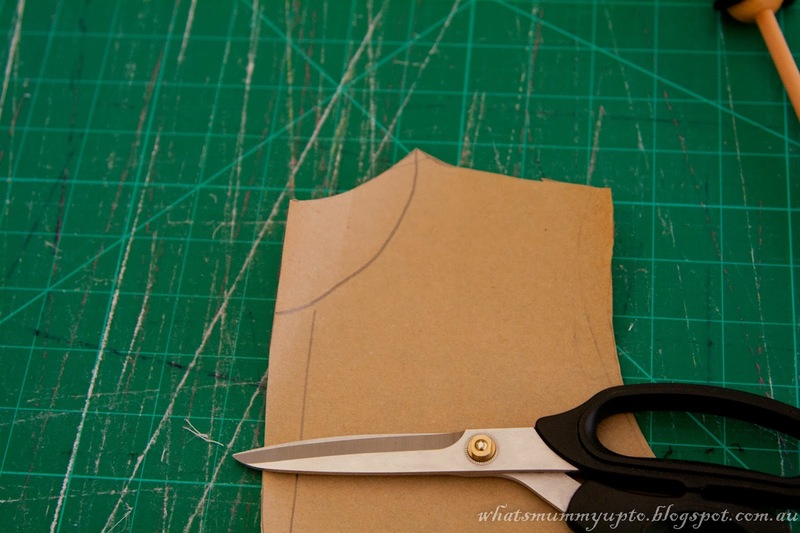 You can also cut out your sleeves with the top edge of your pattern piece on the fold of the fabric. 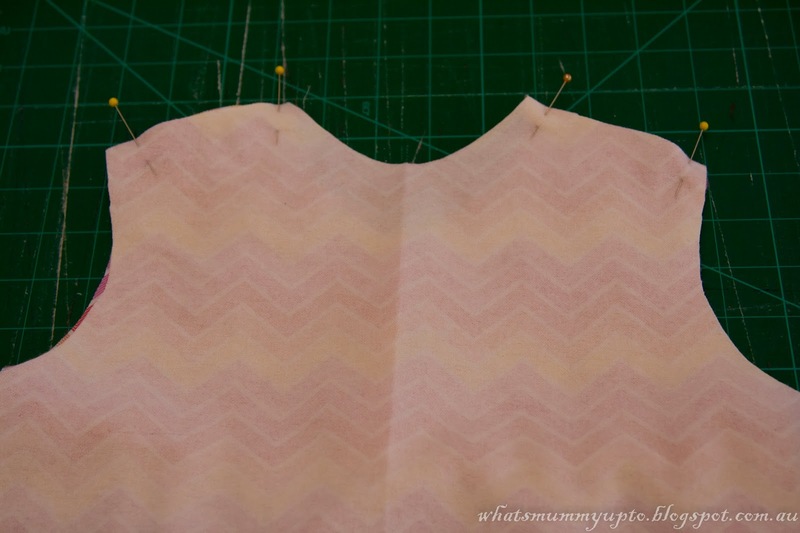 ... then cut along each of these lines, to have your new front bodice pattern piece. 6. Fold your fabric over so that you cut 2 front pieces out at a time. 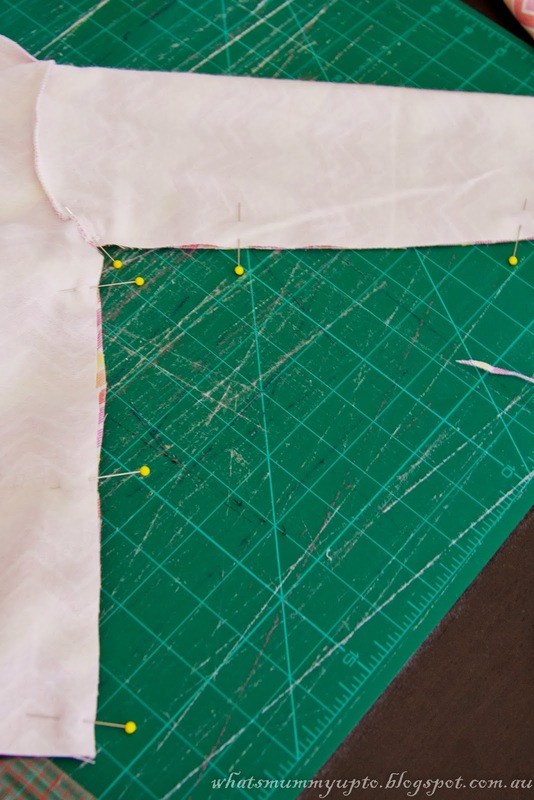 Place the pattern next to the fold line and pin in place. 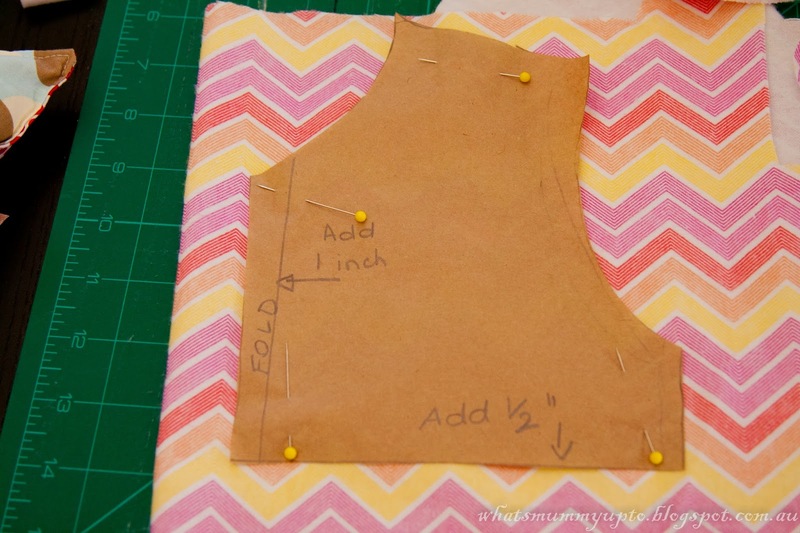 PLEASE NOTE: As per the markings on my pattern piece you need to make sure you add 1" at the fold line when cutting the front bodice to allow for the button tabs. You also need to add 1/2" at the bottom of the bodice for seam allowance. 7. After cutting around the pattern piece, simply cut down the fold line to make 2 front pieces. 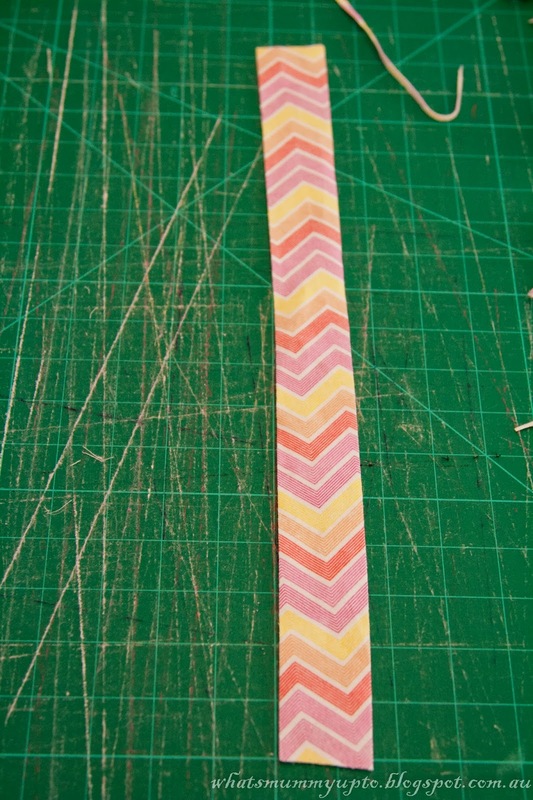 I did it this way as I was using a directional print, and wanted my chevrons to match up in the front. 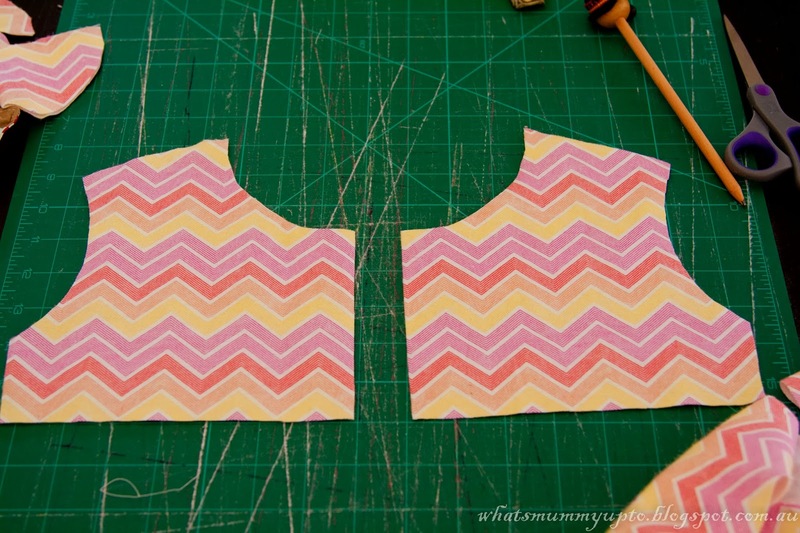 You could always just cut them out separately if you want to. 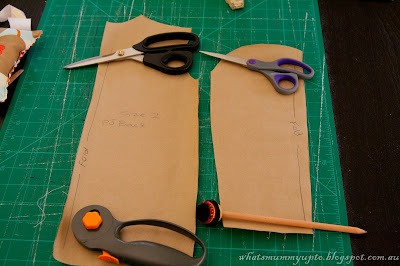 ... then measure the length of the section of pattern you cut off when making your front bodice pattern. Mine is 9". 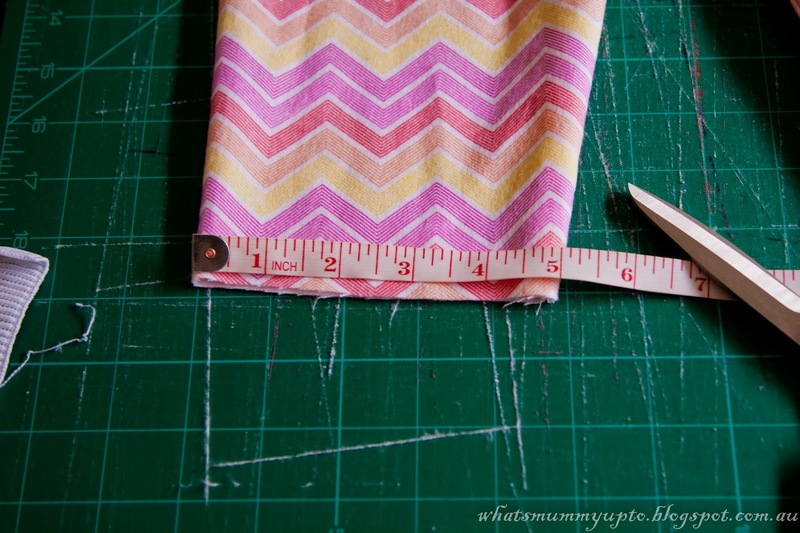 Add 1/2" seam allowance ... = 9 1/2". 9. 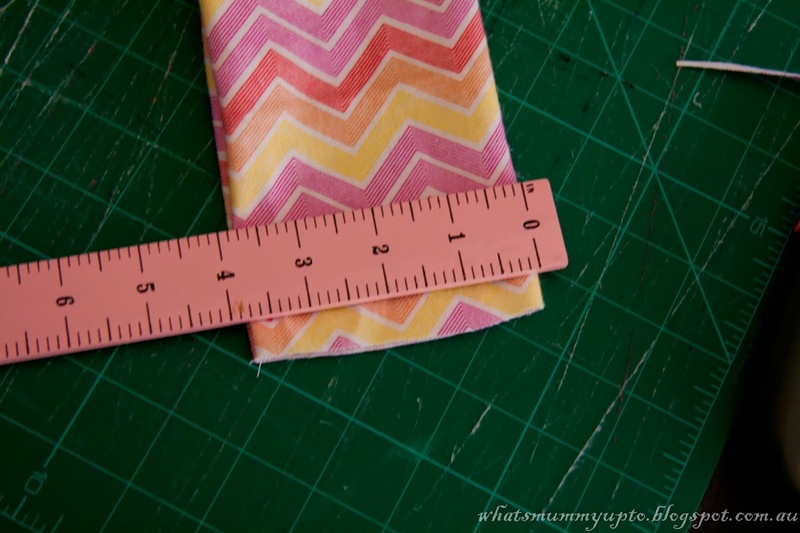 Cut a rectangle that is the dimensions you just calculated ... mine is 18 1/2" x 9 1/2". And there's your front pieces all cut out, and that's probably the trickiest bit done! 10. 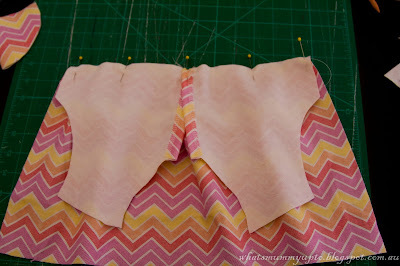 Finish the raw edge of the front centre line on both front bodice pieces. 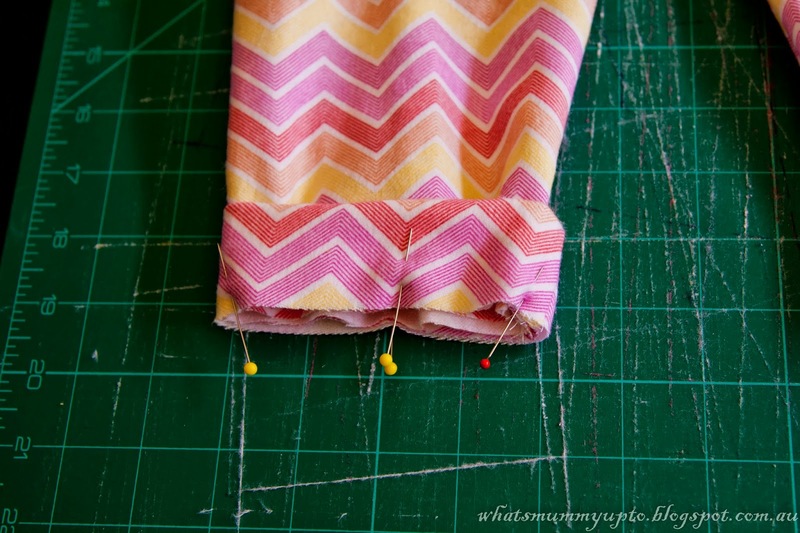 (Either use an overlocker/serger, or a zig-zag stitch). Fold the edges under 1/2" and sew down 1/8" from your finished edge. 11. 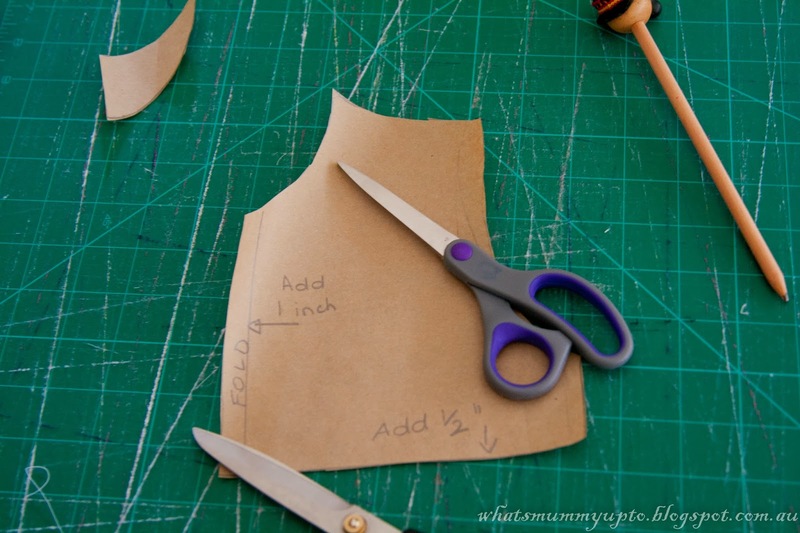 Overlap the two pieces to create a curve neckline. This is how it will sit when finished. Pin, then baste 1/8"to join the 2 pieces together at the very bottom only. 12. 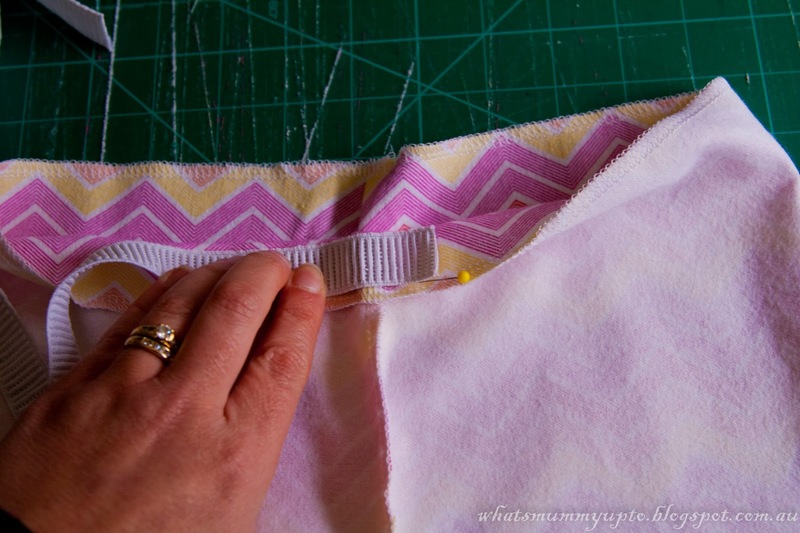 Grab your "skirt" rectangle and sew a gathering stitch 1/4" from the edge along the top (long) edge. 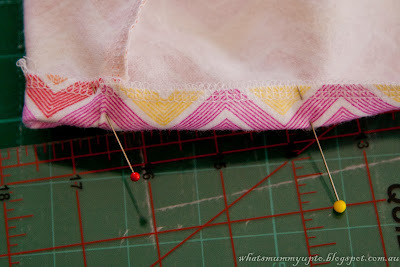 Set your machine to the longest stitch length (on mine it's 6), and you will notice it starts to gather a little as you sew. 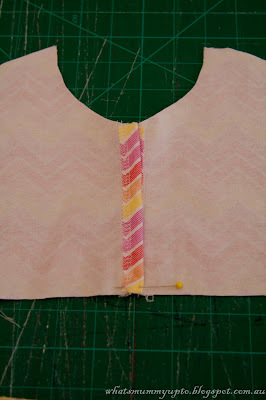 Then pull EITHER the top or bottom thread to gather the fabric until it is the same width as your bodice. Run your fingers along the gathers, trying to make them as even as possible along the width of the fabric. If you're having trouble, it can help to press the gathers in place with an iron. 13. Flip your bodice right-side down to line up the raw edges of the bodice and "skirt", and pin them together. Then sew using a 1/2" seam allowance. 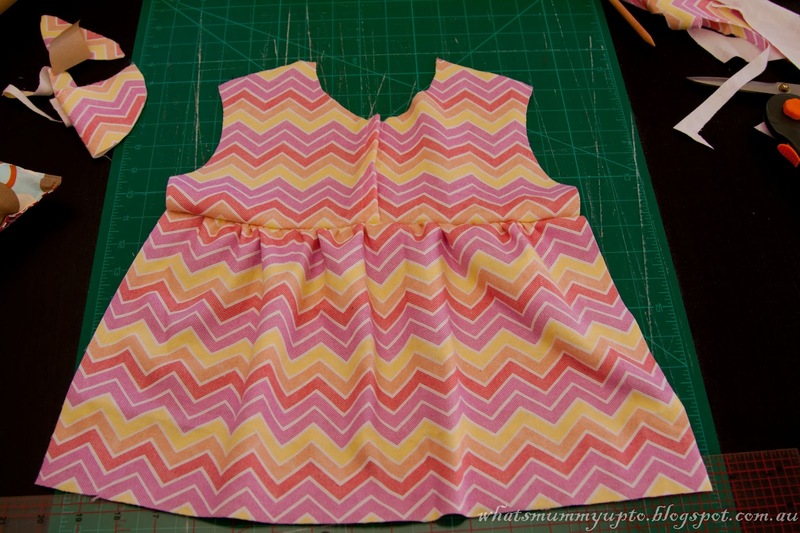 Finish the raw edges with an overlocker/serger or with a zig-zag stitch. 14. Place the back piece on top of the front piece, right-sides facing, and pin the shoulders together. 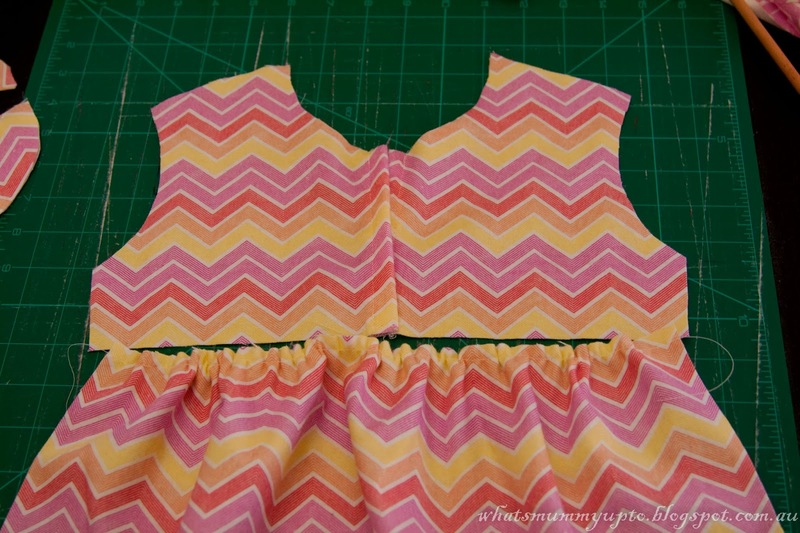 Then sew the shoulders using a 1/2" seam allowance and finish the raw edges with an overlocker/serger or with a zig-zag stitch. 15. 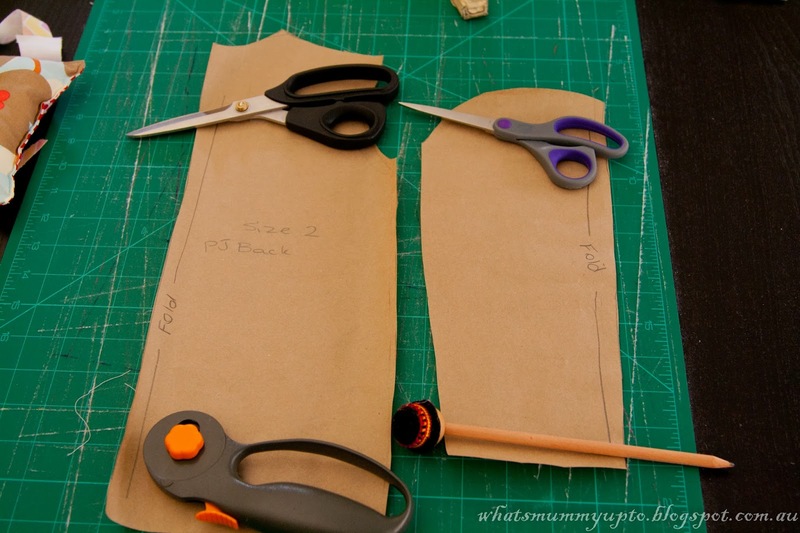 Grab your sleeve pieces, and open them out, then lay the opened-out sleeve piece across the arm hole, right sides together and pin. Sew along the arm-hole to attach the sleeve, using a 1/2" seam allowance. Repeat for the other sleeve. 16. Turn your shirt inside-out, and pin along the sleeve and the side-seam of the top, then sew using a 1/2" seam allowance. I find it helpful to pivot with the needle lowered at the armpit corner to get a nice sharp turn. Repeat for the other sleeve, then finish all the raw edges with an overlocker / serger or zig-zag stitch. 17. 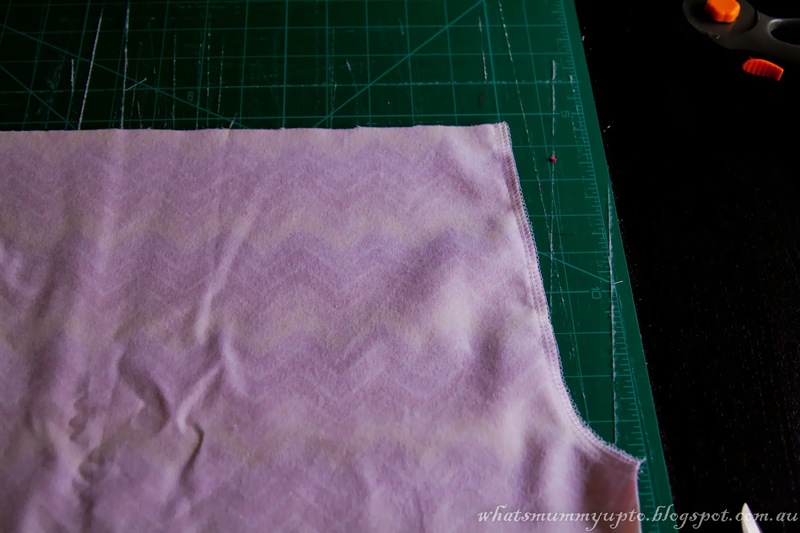 Finish the bottom raw edge of the shirt with serger/zig-zag and fold under 1" and sew 1/8" from finished edge right around to make a hem. ... cut a strip of fabric 2" wide by as-long-as-you-can ... I think mine was about 18" long. 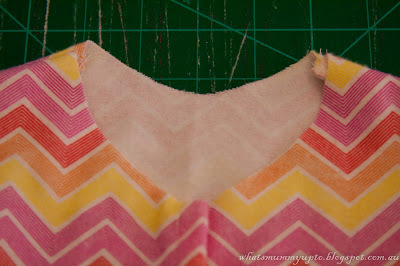 ... pin the tape around the neckline, and sew down, finishing the end off in the same way you started ... seriously, check out CINO's tutorial on this ... it's much better than my instructions/photos. You'll end up with something like this ... only I'm sure you'll be better at that than I am, and yours will sit much flatter than mine! ... I also repeated the piping cheat with ribbon as per the pants (see above). 20. 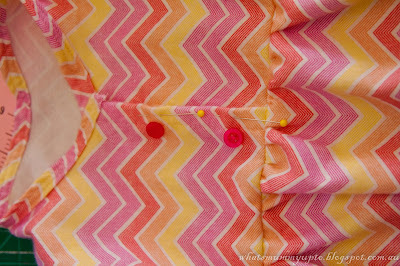 Next grab your buttons ... I chose to use 2, but depending on the size of the PJ's you're making, you might like the look of 3 buttons better. 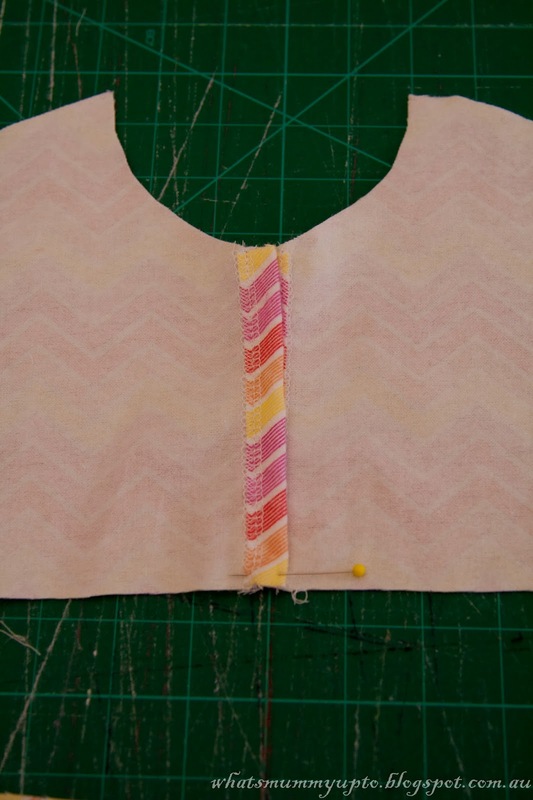 Sit them on the front of the shirt and get an idea of placement, and mark with pins where you need to make button holes, then sew the button holes on the outer flap. 21. Use pins, or a pen to mark through the button hole to where the buttons need to be sewn on the under flap, then sew on your buttons. And there you have it. PJ's complete! As always, please feel free to email me with any questions, and I would love, love, love to see any pics if anyone makes a pair of these. oh so cute! Love them, wish I had a pair. I know, don't they look snuggly. I'm sure they'd work for an adult too! I love your tutorial. Thank you very much. Thanks so much for reading Pilar! Thank you so much for sharing! 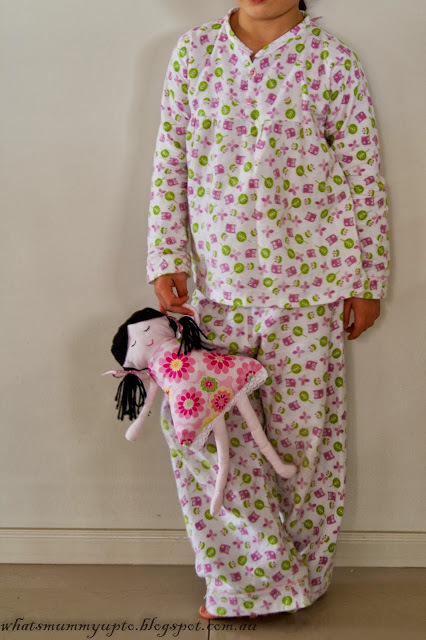 I just made a nightgown for my daughter, and then started googling to find pajama patterns. This is exactly what I had in mind!! Yay, so glad you found this Tasha. When you make them feel free to drop me an email with a pic. I'd love to see!! 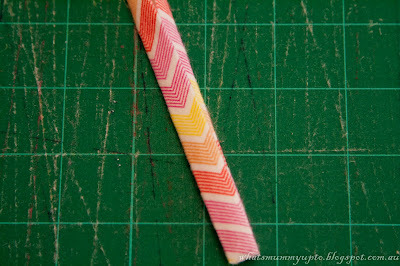 This is the most neatest thing i made so far .. thank so much .. very clear instructions !!! Thanks Reshani. I'd live to see a picture if you could send me one! Glad they worked out well for you! 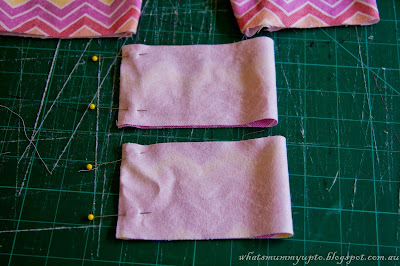 I HAVE been sewing ... Here's the proof!